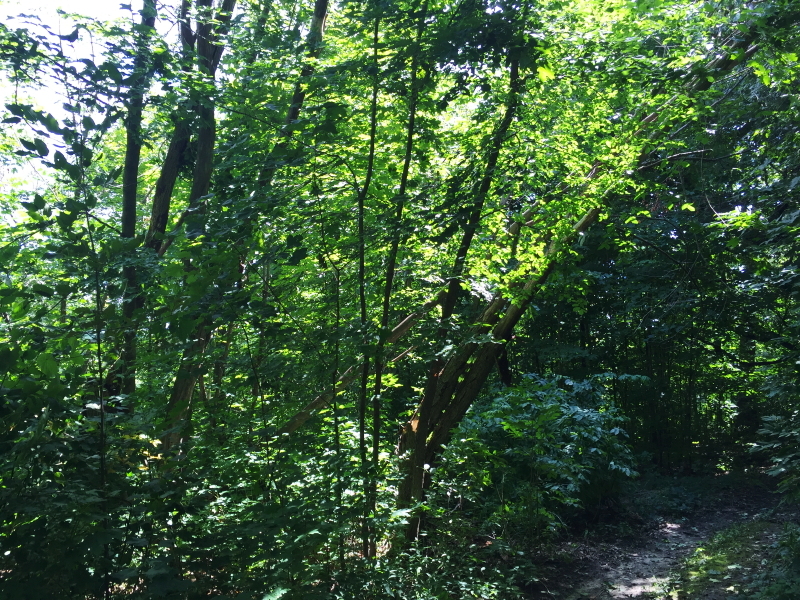 Yesterday was mostly consumed with diesel tractor maintenance, complimented with a brief session of lawn mowing, but there was still time for a stroll through the woods when Julian and Allison stopped by to visit. 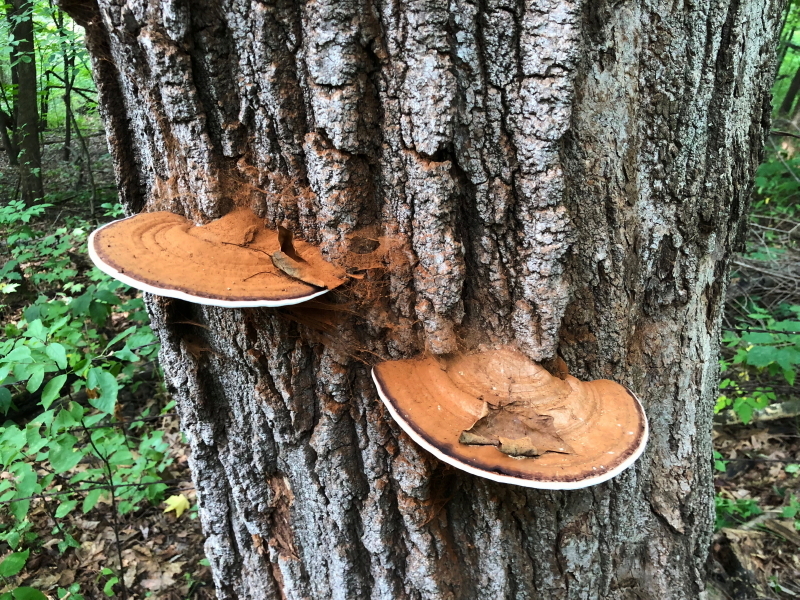 We came upon an interesting fungal conk growing on the bark of one of our old trees. This tree suffered significant damage in a tornado that passed over this property two years before we arrived. The top broke off, and I expect the gaping wound that resulted is where the fungus made its way in. Plenty of new growth has sprouted in the years since, but this tree is probably on borrowed time. It has been here so long that it grew around an old barbed wire fence that was probably put up before the tree had sprouted from the ground. That can’t be all that good for the tree, either. In the morning yesterday, while following Delilah on her first walk of the day, I noticed a newly toppled-over dead tree much further into our woods, looking to the left from this tree with the barbed wire and conks. It is the second one to fall in about a week. I’m wondering if, in the absence of any obvious wind events, maybe the dry spell we are in has contributed to the falling timber. I’m overdue to be putting in hours as a lumberjack around here. Maybe the old wood is just trying to get my attention. At least the diesel engine has fresh oil, a clean air filter, and the tractor has new grease in all the fittings. The wood chipper accessory is going to get called to duty relatively soon, I believe. All I can do is what I can do today. Mentally, tasks pile up beyond my ability to execute, often resulting in my getting even less accomplished than I otherwise could. Just like excessive heat will sap strength and endurance, the visualized burdens of work that should be done drains my energy and motivation. 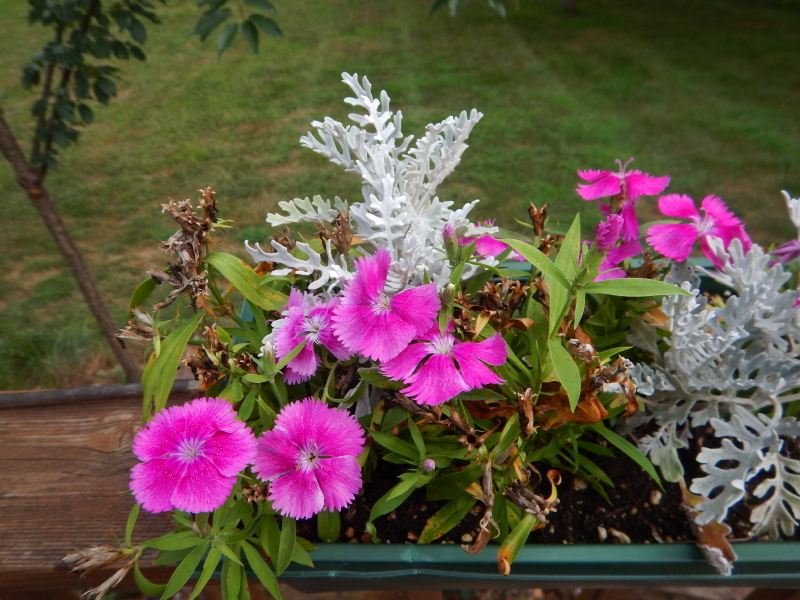 This summer, there are signs of neglect at every turn that have me on the verge of choosing to simply ignore them in hope of recovering at least enough impetus to accomplish one deserving chore per day. The problem with that solution is that my gift of intentional ignorance is susceptible to getting out of hand. It would be far too easy for this place to take on the appearance of neglect run amok. Might be time again to make a list and establish priorities. I’m more inclined to allow tasks to grab my interest as I’m treading from one thing to the next, but working a prioritized list does help keep me from completely ignoring things that shouldn’t be neglected. I do have a default priority of seeking to at least maintain an ‘appearance’ of fastidiousness here, by maintaining the landscape by the road well enough to fool passersby. The recent coarse shredding of growth along the right-of-way has left a gaping mess that I hope to improve, but for now is nothing but an eyesore. Yesterday, I dipped my toes into the project and was disheartened to discover how much work it will be to get it to the state I would like to see. That machine they use twists and shreds the branches into a tangled mess, and there are a lot more of them left lying there than I was aware. In addition to pulling out and disposing of those, I need to cut off all the sharpened short spikes of growth left behind where the operator didn’t cut all the way to the ground. Some are small enough to be snipped with a lopper, but others deserve the chainsaw. There is plenty of debris that could be run through our chipper, but I’m inclined to haul it the short distance to my project of a border wall of branches creating a hedge barrier to the cornfield just to our north. The rest of that hedge wall needs to be trimmed, as well. The diesel tractor needs an oil change before I put it to work on a big project. 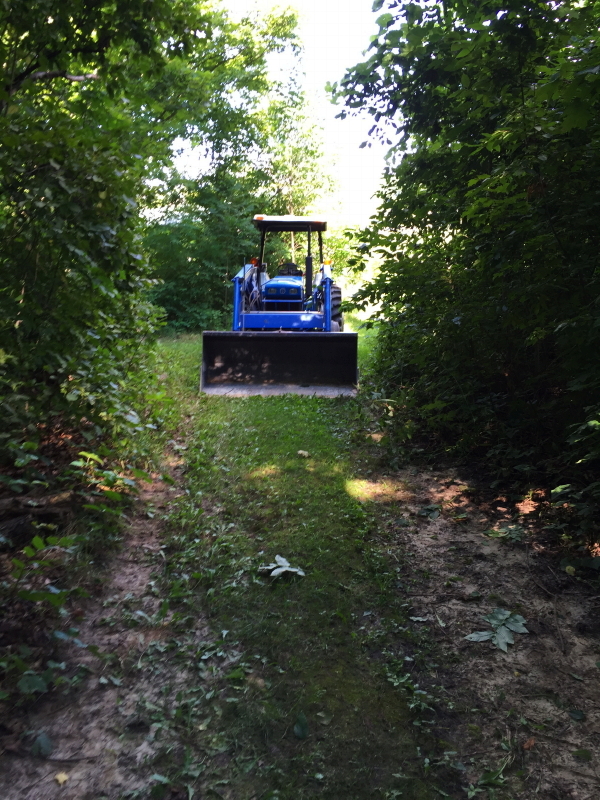 The diesel tractor is needed to mow the dry creek drainage along our southern border. Also need to move lime screenings to the paddock. Want to blade the gravel drive around the barn. The trail along the outside of our fence needs to be cut back with the power trimmer. The fence line needs to be trimmed. The trails need to be trimmed. Dead trees recently fallen in the woods and on one trail need to be cut up. Standing dead trees could be cut down, too. Would help look less neglected around here. The arena needs to be mowed. 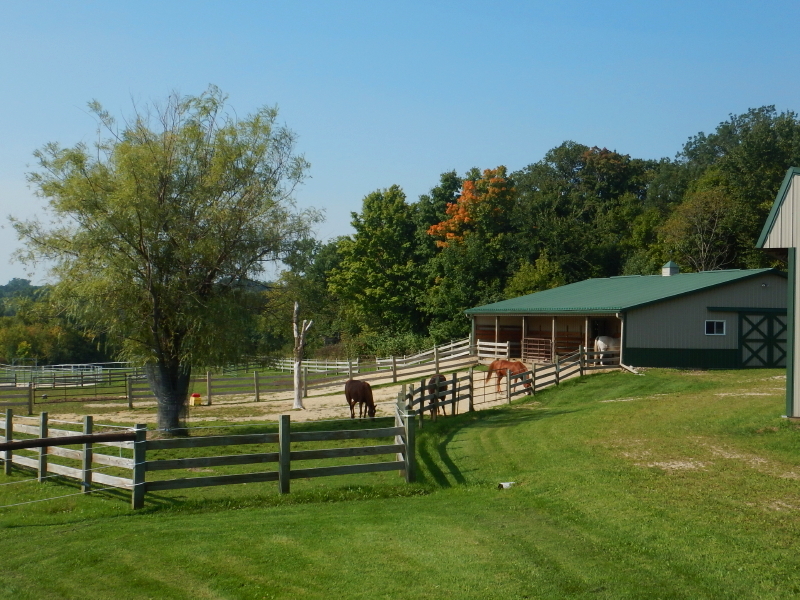 The round pen needs to be raked and grass around gazebo mowed. The back up generator needs an oil change. That’s what needs to be done today. I’ll start tomorrow’s list later. Right now I need to go out and see what grabs my attention to work on so I can avoid everything else that is on today’s list of chores demanding attention. Things are growing more orange around here. Yesterday at breakfast, Cyndie called me to come look at the difference in color of our eggs, compared to the ones purchased at the grocery store. 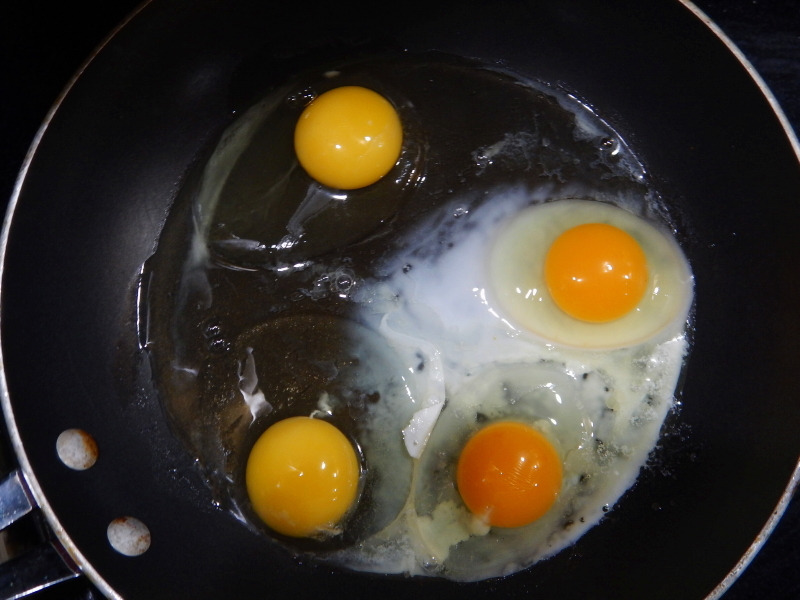 Looks like the free-range diet of our three chickens is producing deep color in the yolks, seen on the right, below. We spent the Labor Day holiday doing a lot of work, for a day off. Starting with a couple of hours cleaning out the compost area, using the loader bucket on the diesel tractor. 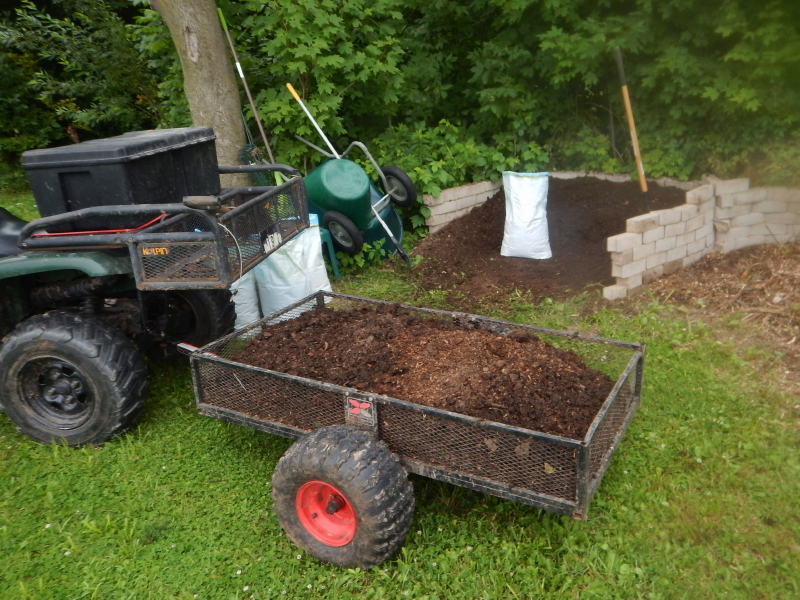 There’s now plenty of room to store a winter’s worth of manure, just in case winter gets around to showing up. Then we split up and Cyndie used the power trimmer in the labyrinth, while I entered a race against time to get the hayfield mowed before it rained. Looking back toward the horses, I spotted another splash of orange color erupting from the green of our tree line. It’s beginning to feel a lot like September. At the end of a long day’s effort, we put our tools away and headed for the house under the drops of a perfect late-summer rain shower. It starts out as luscious green grass. The horses eat it and their bodies process it. They spread it on the ground for me to scoop up and shape into big piles. In the piles, microorganisms take action and the temperature climbs to around 160° (F). Eventually, things settle down and the pile cools. At that point, it’s ready for use feeding growing things which puts that luscious green back where it came from at the start. The final step is loading some bags for sharing our wealth with others. My project yesterday was a little more involved than usual after the chickens showed up to offer assistance. Their version of helping seems to always involve getting as much in the way as they possibly can. I tried negotiating with them, but it seems as though they don’t understand English. 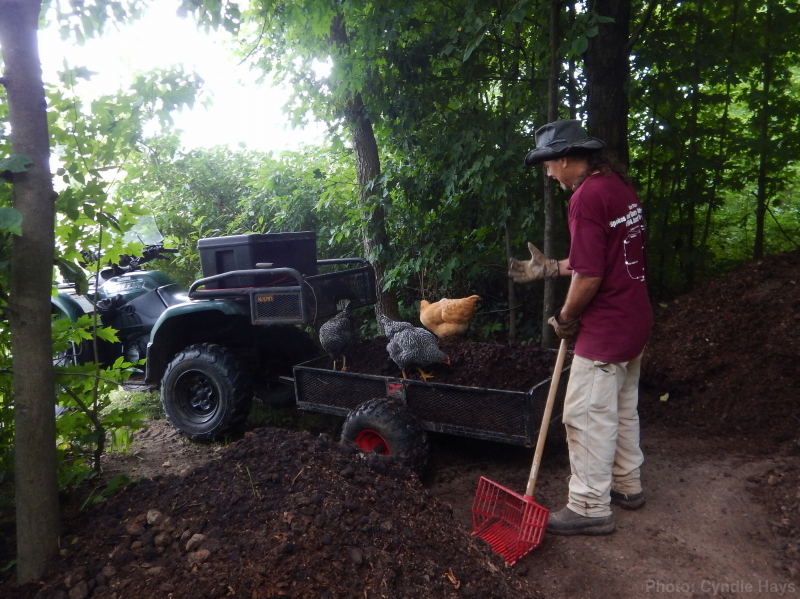 Compost work was interrupted by lunch, after which our attention shifted to the north pasture. With Cyndie assisting, we pulled the posts with a chain and the loader bucket of the diesel tractor, which cleared the way for me to mow the overgrown field. Well, not exactly. The evergreen trees in that field have gotten so big, the tractor doesn’t fit between many of them anymore. It becomes a maze of weaving around groups of trees that are often too close together to provide easy weaving. The night ended with a small setback, as the chickens made their way into the tree over the compost piles again before we could entice them to the coop. It seems as though the training for that may not have a final step, but will be a repeating exercise for some time to come. 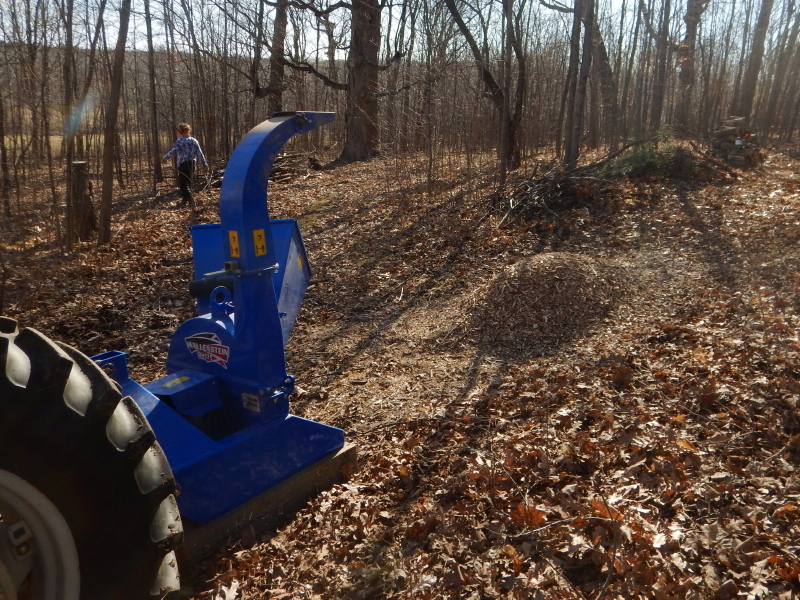 Every time I use our wood chipper, I grow more enamored with the machine and what it does for us. For me, it has become the most satisfying repeated task of property management that we undertake. 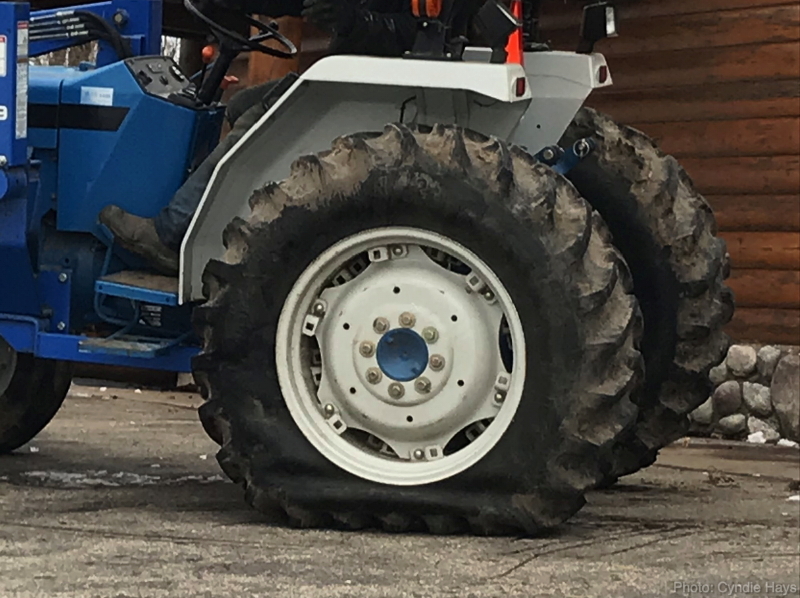 It is relatively easy to set up, makes good use of our otherwise under-utilized diesel tractor, and it makes quick work of the chipping. I love the way it transforms an unsightly nuisance of constantly accumulating dead (or recently pruned) branches into a precious resource of wood chips. We will never have enough. 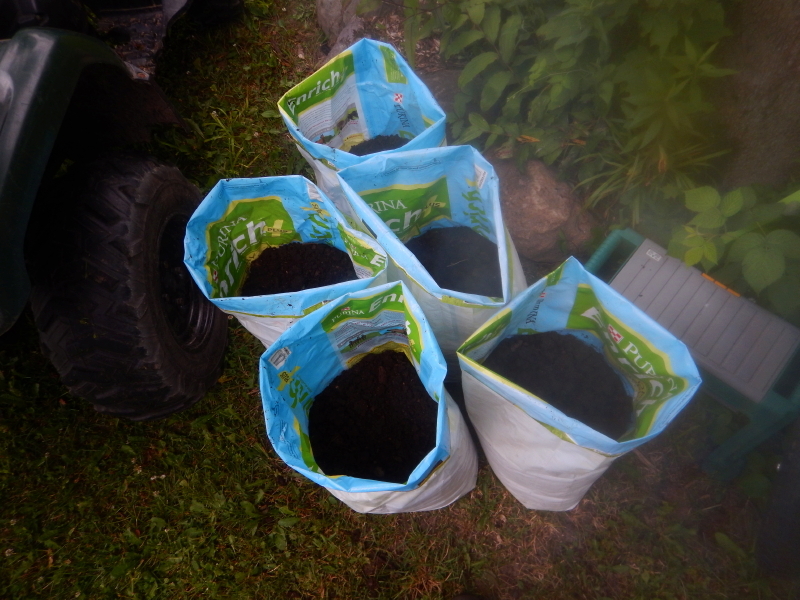 We use the chips around plants in the gardens and landscaping, as well as a covering for our many trails. That is, we hope to cover the trails. 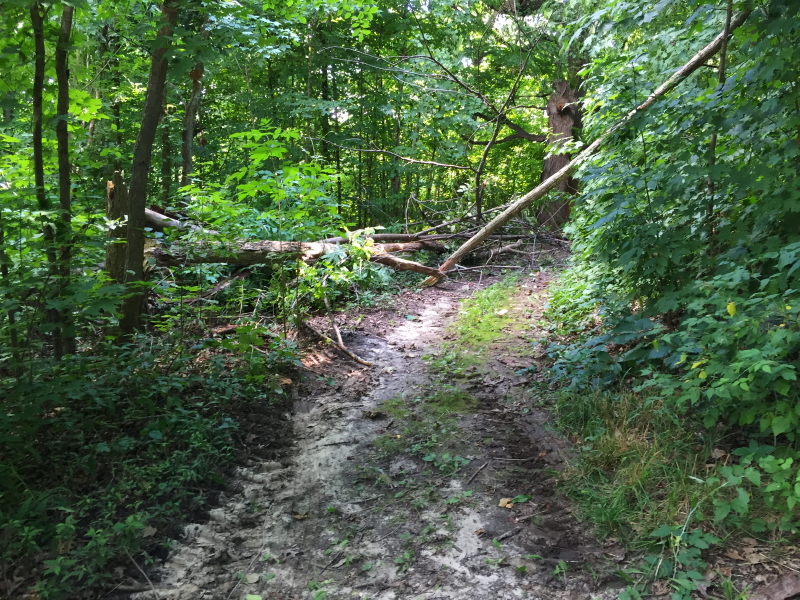 Right now, we have a lot more trails in need than we have wood chips to cover. And it would be a most satisfying additional few hours, indeed. Despite the inherent risks in dealing with trees that have blown over, but remain hung up in the branches of other trees beside them, I chose to see if I could push them over using the loader on our tractor. Whether or not it made any sense to try, I forged ahead on the idea that it just might work. First, I needed to attach the loader bucket that I’ve recently taken to storing at one end of the hay shed. The following is pretty much how the previous week unfolded for me, in terms of frustrations. As I approached the hay shed on the tractor, I realized the trailer on the back of the truck was parked directly in front of the spot I needed to reach. Keys to the truck were up at the house. I caught sight of Cyndie just crossing the yard and shouted to ask if she could grab the keys. For some unidentified reason, this happens at very unpredictable odd intervals. The truck needed to have its battery charged again. It was parked far enough away that it would require an extension cord, and then I realized the nearest outlet was dead because I had borrowed the circuit breaker last fall to use for the waterer over the winter. I swapped out the breaker, got the battery charging, and decided to do some lawn mowing. All that served to do was intensify my frustration over the odd problem of the middle blade not cutting and the outside blades cutting low. Something more than just a broken bracket must have gone wrong when it failed last week. I did the bare minimum of ugly mowing and then put it away to start the truck. All that frustration before I could get to the task I intended. Compared to those hassles, the rest of my project went swimmingly. I pulled up to the trees, lifted the bucket to test the weight, and after an initial slip, successfully pushed the trees over with a resounding crash. Yikes. It was both scary and satisfying. Most of all, it wasn’t frustrating.